We need clean water for drinking in order to preserve our long-term health. Unfortunately, much of today’s hardware and equipment is tainted with chemicals and toxins harmful to the human body. That’s why I highly recommend to use lead-free drinking water hoses that are safe and healthy for you and your family. Should You Invest In a Good Drinking Water Hose? Recent studies have shown that the garden hoses we’ve been using for decades are made with highly toxic chemicals and lead content. These toxins are said to be the same culprits for birth defects, early puberty, hormone disruptions, and various diseases. The following video is a news coverage that further explains the dangers of freely using water from hoses with lead and chemical content. Drinking water hoses have been specifically designed to be compatible with low lead content certification laws to give your family safe and healthy drinking water. Another added benefit to these lead-free drinking water hoses is that the water that flows through them doesn’t come out tasting like chemicals and rubber hoses. Making sure that you and your family have clean water to drink is crucially important for your long-term health. Toxins build up little by little and the effects aren’t usually seen until health issues have taken root. If you intend to keep your family’s water supply safe to drink, it may be worth your consideration to invest in a lead-free drinking water hose. Can You Prolong the Life Of Your Drinking Water Hose? If the manufacturer has done their job of producing a quality product, there are ways for you to extend the life of your hose. 1) Store your hose out of direct sunlight or keep to minimal sunlight during the course of the day. Constant, direct UV exposure can weaken the materials of the hose. 2) When not in use, store without any definite creasing to avoid kinking or cracking. Use a reel to conveniently and smoothly stow away until your next use. 3) Even though the product is described to be able to stand high amounts of water pressure, keep the PSI at a reasonable level. If rig water systems rupture from high PSI settings, why would we put our water hoses through that? Here are a few more tips on how to make your water hose last longer. What Length Should You Buy? When you’re travelling in an RV, every foot of equipment matters. Consider for what you need the hose. You may need a long distance or you may need just a short length to meet your need. Perhaps, purchasing multiple lengths may be a better option to buying one long one. With longer hoses, you may feel that the excess distance gets in your way. With the shorter ones, you may need to take into consideration the amount of length it needs for when it swags from the faucet. Let’s have a look at some different options of drinking water hoses. This CSA Low Lead Content Certified and NSF certified hose, made BPA and phthalate free, is safe for drinking water. It has a size of ⅝ inch diameter and 25 foot length. Delightfully, it delivers water that doesn’t taste rubbery. Manufactured with durable and sturdy UV stabilized PVC material, it’s engineered to resist kinks and stand a maximum water pressure of 100 PSI. It features standard-size connectors that are easy to grip, making installation almost effortless. This heavy duty, NSF certified hose is manufactured in accordance to all federal and state low lead laws. It’s lead-free, BPA free, and phthalate free, making it safe for drinking water. It delivers water that doesn’t taste rubbery. Featuring a ⅝ in diameter which is 20% thicker than standard drinking water hoses, this hose delivers a high flow rate. This 50-foot drinking water hose has been treated for UV exposure to enhance its life expectancy. The fittings and strain relief ends are designed with high quality nickel-plated brass for higher and prolonged performance. Designed to stand high pressures of 160 PSI, this ½ in by 4 ft hose is made with NSF certified materials which makes this hose safe for drinking water. It features durable high-flow fittings and a plastic female connector. It comes with a little washer attached to prevent leaking. The length is excellent for any of your short distance water hose needs. This drinking water hose is designed to stand the high pressure setting of 160 PSI. It’s an NSF certified hose, making this safe for drinking water. This white, ½ in diameter hose is 10 feet long and features hi-flow fittings and an easy-to-use hose gripper. This drinking water hose is designed to stand great strengths of pressure up to 300 PSI. The ½ in by 50 ft hose is lightweight, flexible, and easy to store. Meeting the standards of the Federal Safe Drinking Water Act and California’s strict phthalate content standards, this water hose is made of a medical grade PVC which is safe to use for your drinking water. It features a high UV resistance which keeps it from cracking so easily. The couplings are manufactured with an aircraft grade stainless steel for great durability. Have You Decided On Your Choice of Drinking Water Hose? The Valterra W01-5120 AquaFresh--½ in x 4 ft is an excellent choice if you are looking to cover a short distance from the faucet. It’s a durable water hose that can stand a fair amount of pressure and yet hardly leaks. If you’re looking for a slightly longer length, you may want to consider the Valterra W01-5120 AquaFresh--½ in x 10 ft. At a great price, you can equip your RV with a sturdy, lightweight drinking water hose that kinks less than some other models. The Camco 50 ft Premium Drinking Water Hose is a fantastic choice if you’re needing a long drinking water hose. It kinks less than some models do. It delivers a high flow rate but doesn’t leak at the ends. The strain relief ends give this water hose an added touch of performance. Select a drinking water hose that’s safe and healthy for you and your family, and delivers the performance that will make your vacation a memorable one! 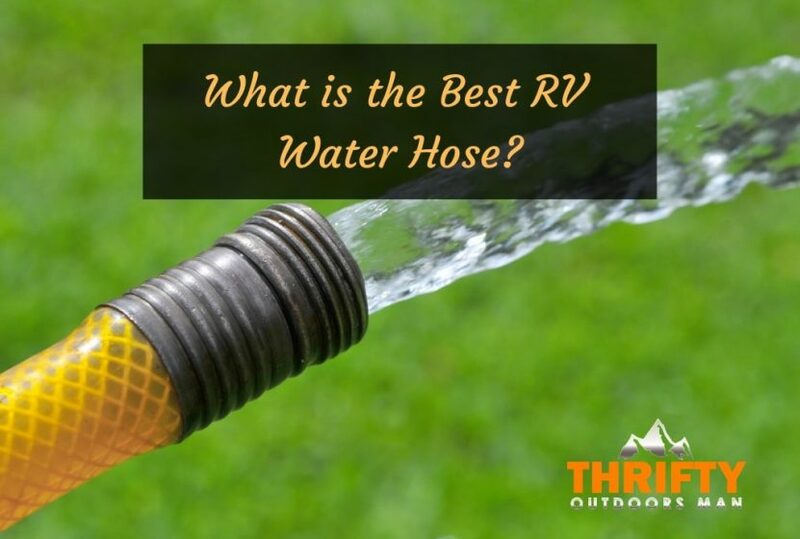 Check out our other blog posts on the Best RV Water Filters, Best RV Sewer Hose and Best RV Tankless Water Heater.